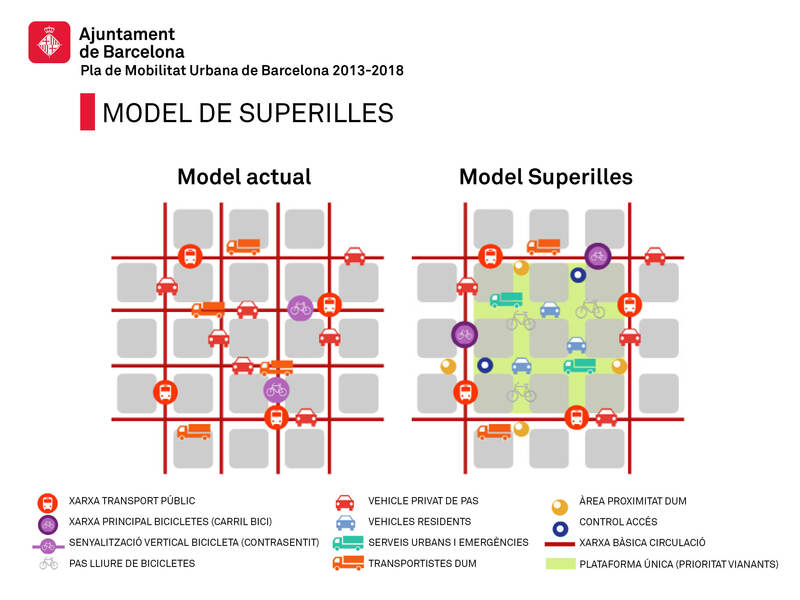 Last week I strolled through an experiment happening in the industrial Poble Nou neighborhood of Barcelona—a “Superilla” or “Super-island” where traffic is being diverted through nine city blocks to create a haven for pedestrians and bicycles. Oddly deserted, people wander through the centers of Cerdà’s vast intersections, which appear to have been taken over by all of the city’s tactical urbanists, and then abandoned. At a few intersections entering the Superilla, cars honk impatiently to avoid the area. A few delivery vans cut through despite the signs. A city worker waters dozens of potted trees haphazardly arranged. People continue to wait for crosswalks, even though they could just walk freely, seemingly unsure of how to manage the freedoms of this new public realm. Online in the newspapers and on the city’s websites, photos of children in makeshift sandboxes and architecture students playing games attest to an enlivened urban environment, but the emptiness that I witnessed looks more like a street festival that was never cleaned up, and in this vacuum the project has created more outspoken critics than fans. On a few surrounding apartment balconies hang signs reading “No Superilles. The neighbors want to decide.” Already, the movement against the Superilles has generated over 3,000 protest signatures on change.org and the protest is growing. Opponents say they weren’t consulted, that the design is absurd, that businesses and neighbors are the ones being made to suffer. Members of the city’s own staff call it a failure of process; they cling to the merits of the proposal itself but worry that the lack of real community input has put the entire initiative in peril. Despite the local controversy, there’s been a celebration of Barcelona’s Superilles in the press. Most of it from the U.S. has been a justifiably jealous reaction to any city that actually prioritizes pedestrians and cyclists, to any city that is willing to challenge the entrenched car lobby, to make its neighborhoods more livable, more lovable. The New York Times article from this September has been shared so often that I would guess most U.S. planners are aware of the project and it’s curious name. It has prompted calls for similar initiatives from Manhattan to Seattle, simply owing to the currency of its idea—of pedestrianizing the street—and to its legitimization by such an expert on the topic, the gold standard of urban design—Barcelona. For those familiar with how citizen participation works in Barcelona, the failure of participatory process is all too familiar. In the “City of Architects,” expert designers know best, and design cities and spaces “for the people” but aren’t comfortable designing “with the people.” As I have written elsewhere, this model of urban governance is not without its detractors or its alternatives, but the culture of expertise is remarkably stubborn to challenges. Even with Ada Colau as the new progressive mayor with a citizens-first approach, architects in charge don’t seem to know better than to upset neighbors with patronizing comments along the lines of “believe me, in two weeks you’ll all be thanking me.” In the guise of participatory urbanism, the spectacle of painting games on sidewalks and in streets, of installing “guerrilla gardens” in car lanes and imprinting “assembly” or “let’s talk” on the asphalt makes a claim of democratic control without relinquishing anything. It pretends that participation means descending into a neighborhood with 200 architecture students from 5 schools to intervene like a flash-mob, and it suggests that community meetings held over the past 2-3 years were open so if people didn’t attend those that is their problem. It confuses the quick and fun games of tactical urbanism with the commitment that it truly takes to design and maintain a community collaboratively. The lesson of the Superilles are being learned quickly by the city, and with some luck this will make a meaningful difference, but the lack of forethought has come at a cost of credibility. Nonetheless, a series of local workshops and questionnaires have already generated hundreds of comments. What have they learned? That this project conceived by the city’s director of mobility Salvador Rueda 14 years ago and planned over the last two city administrations has tremendous merit, but is still flawed—that neighbors had valid contributions for solving some of the project’s technical issues, and valid concerns and confusions that should have been addressed before construction began, and that a good many neighbors see the change as a vast improvement over the status quo. In the wake of the failed pilot, circulation routes are now being revised, access for emergency vehicles better accommodated, and better communication avenues are being opened. What the city is learning too is that participation matters, and that meaningful participation is not a burden to planning but an asset. Next summer when my students stroll through the Superilles I hope we find plenty of neighbors to chat with and plenty of local support that the city can brag about. I hope we will bring back a good model of sustainable urbanism that has participation as its foundation not its downfall.